Published May 17, 2016 By Anna T. This post may contain affiliate links. Regardless, I only recommend sites I've researched and/or used and trust. One of my favorite things to do as a work at home blogger is help people dodge the scams that are out there. And when you're new to the idea of working from home and begin your search for a real, legit job you can do, you will most likely find yourself asking if this is a scam or that is a scam all the time. So even though I already have a lot of “how to spot a scam” info posted on this website, I thought that it would be handy to create for you a little checklist that you can go by the next time you come across an opportunity that you just aren't sure about. Now, of course I can't guarantee that my checklist will 100% steer you away from something shady, but I think it will certainly help. Be sure to bookmark this for future reference! #1 – First off, if the information is not available, find out the name of the company hiring. I know sometimes on Craigslist and other sites, the company name may not be listed. If there is an email or a way you can get in touch with who posted the job, drop them a line and just ask who they are. You simply cannot do the necessary research if you can't find out who this is. #2 – If you know the name of the company hiring, immediately Google them to find their website. Before you start reading about the job on the site, just get an overall first impression of the site. Does it look professional, or does it look junky and thrown together? While it's true that scammers are capable of creating websites that look professional, and that there are some reputable companies who have fairly unattractive, junky-looking sites, it should still raise a red flag if the site looks very unprofessional. #3 – Now, check to see if this company is operating a real business online that they would actually need workers for. If someone has the money to hire you, they must also be operating some sort of business that generates the money they pay you with. So check the website out thoroughly to make sure that they are advertising their services — not just their need for workers. #4 – Next, check out this company's social media profiles. Again, if they truly are operating a real business that they might need workers for, you are likely going to see evidence of them promoting that business to find clients on Facebook, Twitter, etc. Finding clients is always the number one priority of any business. Sure, they might advertise their work at home job postings on social media, too, but if that's all you see, proceed with caution. It's also a good idea to read the comments and timeline posts made by others on the company's Facebook page, just in case any workers have mentioned anything publicly about the job. #5 – Read the job posting thoroughly and pay most attention to the nature of the work, the qualifications you need, and the money they promise you'll make (if this is listed). Is it super easy work that anyone can do, and that also pays amazingly well? If so, that red flag needs to go up. Why? Because super easy work that anyone can do, that you need no special qualifications for, and that also pays very well, is practically non-existent. You might be able to find an easy job, but it will usually not pay well. Jobs that pay well are either difficult, or they require you to be skilled and/or have past experience in something. There's almost always a trade-off somewhere. If it sounds too good to be true, it usually is. #6 – Think about the nature of the work. If the job says that you're getting paid to post ads, do data entry, stuff envelopes, or process rebates, be very suspicious. Scammers love to post ads saying you'll get paid a lot of money to do mindless tasks. While there are legit online data entry jobs out there, it's rare. I'm automatically suspicious of any data entry job postings I find until I confirm that the company offering the work is an actual business who would need the task performed. #7 – Now, check to see if you're being asked to pay something to get started. With few exceptions, real work at home jobs don't come with fees. Some exceptions that come to mind are Arise (which is actually more of a home business opportunity) and Contract World. It's not uncommon for a company to ask you to pay for your own background check, but fees for other things, or fees with no explanation at all, usually just don't make sense. Think about it this way. If you're applying for a job outside the home and the interviewer says, “OK, we'll hire you, but only if you pay us $39.95.” What would your reaction be? You'd be suspicious. And you should be with a work at home job, too. #8 – Do a search for the company on Glassdoor and the BBB. Glassdoor is fantastic for figuring out if a company is legit or not because employees are allowed to post reviews, salaries, etc. anonymously. If the company has a profile on Glassdoor and it looks like people have shared information about working there, that's a good sign the company is for real. And as stated above, it's always a good idea to check and see if the company is listed on the BBB and if they have any complaints against them there. #9 – Do a Google search on the company followed by the word “scam.” People like to make as much noise as they can online when they get ripped off because they are so angry and want to warn others. If the company you are considering has ever wronged someone else, there's a good chance something will turn up online about it. #10 – This one is the oldest trick in the book! If the company wants you to allow them to send you a check that you can use for office or business supplies to deposit into your bank, and then asks you to wire a portion of that money back to them, you are 100 percent getting ripped off. People still fall for this one every day. The check will be fraudulent, and when the bank discovers this, the responsibility of paying back all that money will fall on you, since these scammers will be untraceable. Some people even end up facing jail time. #11 – Think about how you found out about this job. Did the company contact you first, and ask you to apply? Or did you find the job on your own? Be suspicious of any emailed offers of employment from people you don't know. Companies rarely ever solicit workers directly, unless you've posted your resume publicly on a job site. And even then, be on your guard because scammers will take this information and attempt to contact you. So that basically covers it! Just go through this checklist when you get that “unsure” feeling about a potential work at home job, and it should protect you the majority of the time. Unfortunately, nothing is completely fool proof. 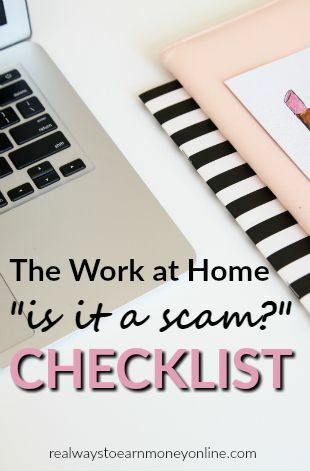 I do have a few more tips for spotting work at home scams here, plus some advice on what to do if you get taken in by a work at home scam and need to report it. Wondering Where To Find The Legit Work at Home Jobs? Excellent post, Anna. Very well researched. Thanks for all of these great tips. I might be looking for a work at home job over the summer, so I will definitely keep these in mind. Good luck to you! I hope these tips help you dodge the scammy postings. This is a great checklist, Anna. In one of my posts, I also recommend researching licenses where applicable. A company that says they sell health insurance used to advertise their work from home jobs on Craigslist. I started researching, and they failed a couple of quality checks that you mention here. Then I checked for an agency license with their state department of insurance, and there was no record of the company! Since selling insurance without a license is illegal, it was clear that insurance wasn’t their actual business. Great idea! Thanks for passing that tip along! Excellent article. Very sensible advice.